Divorce can often be expensive and also change a person’s finances to the point where filing for bankruptcy is the only logical option moving forward. Bankruptcy during divorce or shortly after the divorce is finalized can affect certain issues that the divorcing spouses should be aware of when finalizing the divorce. 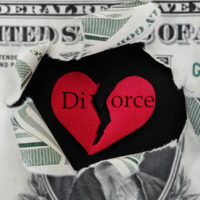 In a divorce, a court has to determine which spouse will get which property, as well as which spouse will be responsible for the couple’s joint debt. If the court finds it equitable to do so, it may award one spouse more debt than the other, and order that spouse alone be responsible for paying that debt off. This technically lets the other spouse off the hook in terms of making payments on the debt. It is important to remember that creditors are not a party to the divorce proceedings, and they do not have to abide by the rulings made by the judge in the divorce proceedings regarding which spouse is responsible for the debt. If loans or credit accounts are jointly owned by the spouses, the creditor has a legal claim against each spouse even after the divorce. So, if the spouse who is ordered to pay off the debt fails to do so and then files bankruptcy, the creditor can still take legal action against the other spouse in order to have the debt paid in full. The bankruptcy discharge for one spouse does not mean the debt is extinguished against the other spouse if jointly owned. While the spouse who is pursued by the creditor can take legal action to recoup any payments made to the creditor from the bankrupt spouse, seeking these repayments can be a long and ultimately fruitless endeavor. It sometimes may make more sense for a couple that has overwhelming jointly owned debt to file for bankruptcy together before the divorce. This can eliminate the debt obligation as to both spouses, reduce the number of issues to be resolved during the divorce, and reduce the bankruptcy and divorce costs. If the spouses are getting along and can trust each other not to hide assets or otherwise try to be dishonest with the bankruptcy court, filing for bankruptcy together before divorce is an option that should be explored. A spouse who is ordered to pay child support, spousal support, or both, cannot file for bankruptcy in order to avoid making these payments. These obligations cannot be discharged in bankruptcy. A court proceeding to establish a person’s obligation to pay child support is also not suspended by filing for bankruptcy. On the other side, child support can be counted as income for a person filing for bankruptcy; if the child support payments are not actually being made and received, then they may not be considered as income. For the intricacies of this and other bankruptcy issues, it is important to consult with a bankruptcy attorney. For more information on how you may be affected by your spouse filing for bankruptcy during or after the divorce, contact an experienced divorce attorney at the Media, Pennsylvania law firm Barbara Flum Stein & Associates serving Delaware County in all family law matters to schedule a consultation.